Bold colors, clean lines, geometric shapes….but nothing frilly here! Wow! Today my son is graduating. I am so proud of him and all that he has accomplished. Congratulations, Matt! I made this card after seeing it by Mary Fish. I love this little ‘smart owl’ – he looks so academic with his eye glasses, mortarboard, and diploma. I used Crumb Cake & Midnight Muse as my color combo. (Matt will be wearing a navy cap & gown.) Keeping with the academic them, I popped this little guy up on a 2-3/8″ scallop circle punched from our In-Color DSP with words on it so it looks like a page from a book. This circle was then placed on a belly band to hold the double-door opening card together. Two strips of Natural Composition DSP paper in the wood grain pattern were used for the card front, as everyone knows that owls live in trees. The owl was a hoot to make! I started with our Owl Builder Punch, the wings were made with the Scallop Oval Punch. The top part of the mortarboard started out as a Petite Pennants Builder punch which I cropped by hand. The hat part was snipped out using the Paper Snips freehand. I also snipped little strips of paper to create the eyeglass frames. Linen thread created the tassel and holds the diploma in place too. A little bit of Crumb Cake ink was sponged around the edges of the owls body & wings to contrast. Please leave me a comment and let me know how you like this card. If you want to make this, and need any of the supplies, you can click on the hot links on any product listed, or click here to go to my online store and place your order securely and have it shipped right to your house! You don’t need to be a graduate to know that’s the smart thing to do. Thanks for stopping by. If you’d like to leave Matt a ‘Congrats, Grad’ comment, please do. I’ll pass along all of the well wishes to him and he’d be so happy to receive your wishes. A good friend of ours just retired after 39 years on the job. A very festive Retirement Gala was held in his honor. I know that Larry will be planning to spend alot of time on the golf course in his retirement (he had an 8 AM tee-time scheduled for the next morning!) so I made this card just for him. Inside was a gift card to a local golf shop. I don’t do too much punch art but I really had fun making this card, and it was so simple. A piece of our new Soft Sky was used as the card base. A piece of Wild Wasabi was repeatedly snipped with Paper Snips to create the grass look. I ran a piece of Whisper White thru the Polka Dot textured embossing folder and used what would typically be the back, the depressed side, and punched it out to create the golf ball. I hand snipped the Cherry Cobbler paper for the tee. The Pennant punch created the flag which I mounted on a thin strip of Smokey Slate. The clouds were punched with the Build-a-Cupcake punch. A little bit of Smoky Slate was sponged around the edges of the clouds. I used the new photopolymer stamp set Designer Typeset Stamp Set #132956 for the custom lettering and number on the flag. This was the first time that I used that stamp set and it was really fun to put the letters together to make a custom message. The fun part is that they don’t have to be perfect. 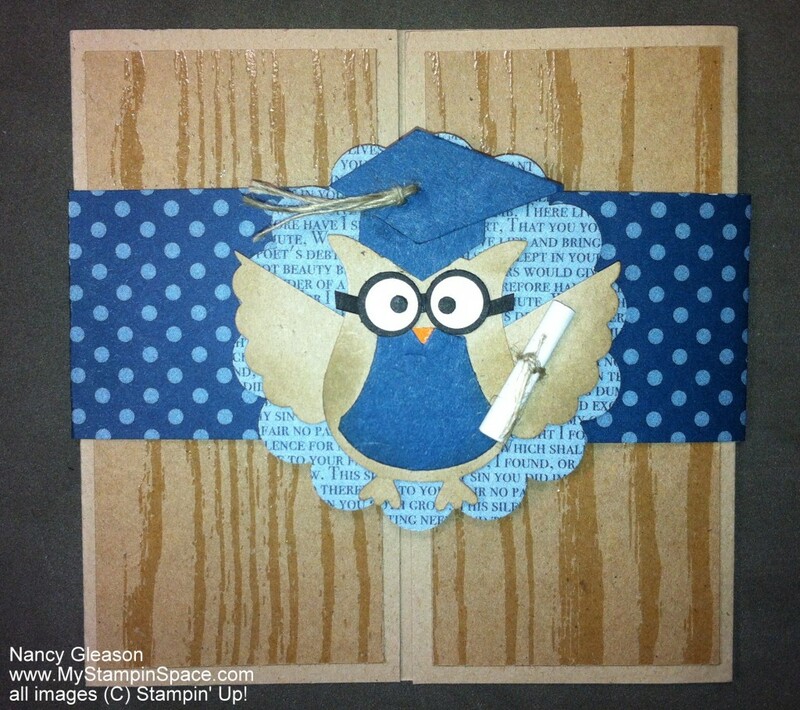 Want to learn more about Stampin’ Up!’s new Photopolymer Stamps? I thought so. Watch this video and find out everything you ever wanted to know about Photopolymer stamps (including just what photopolymer is) but were afraid to ask! So now you have some inspiration to make something for the golfer in your life. Please leave me a comment and let me know what you think. I appreciate all of your comments and love to hear from you and know what you like. 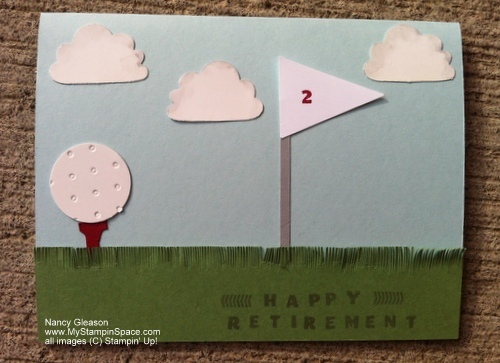 Today’s post is a tribute to another retiring stamp set, Best Dad Ever. I made this for my father-in-law for Father’s Day last year; little did I know that it would be his last Father’s Day with us. I loved the traditional tie with the tie-tack look. It so personified my FIL-a preacher who wore a suit & tie with a tie tack every Sunday. I chose to use Basic Gray and Not Quite Navy for my color combo. Not Quite Navy is another color that will be retiring soon. I really love that color but Island Indigo is a color that we are getting to keep so I’m ok with that trade off. I still have a stash of this color so I’m ok! This stamp set features 5 neckties is various patterns in a row; it’s so easy to isolate just one, or two, or three ties using our Stampin’ Write markers. Four sentiments allows you to use this stamp set to create a masculine card any time of year. I always think a good, masculine stamp set is a great investment and this certainly is top of my list of masculine stamp sets. Find this and all other Retired Stamps here. Retiring Accessories. can be found here. You can order retiring stamps up until June 3rd. Retiring Accessories are only available while supplies last so don’t hesitate if you want something. Stock up on your favorite colors, papers, & ribbons now. Head over to my on-line store and start shopping now. Thanks for stopping by My Stampin’ Space; I love your company and hope that you find inspiration while you’re here. If you enjoy my blog, please sign up for my newsletter and/or subscribe to my Feedburner feed; you’ll see those links on the right. Tell your friends to come over & hang out at My Stampin’ Space too – the more the merrier. See you tomorrow for another farewell tribute. When the annual catalog for 2012 was released last June, one of the first stamp sets to make it to the top of my ‘must-have’ list was Everything Eleanor. The swirl/flourish image, the vintage background image, the pretty flowers & bird, the bordered circle image (just right for journaling in a scrapbook), all called my name. But for some reason, it is one of my most under-used stamp sets too! I set out to change that this weekend. With a boatload of thank-you cards that I need to make and send out, this was the first set I turned to, even though it doesn’t have a thank-you sentiment in the set. For that, I enlisted the help of a new friend, Pretty Petites which I got for FREE from the current Sale-A-Bration catalog along with the coordinating Petite Curly Label Punch which I also got for FREE during Sale-A-Bration. And they coordinate with the Curly Label Punch for layered goodness. A simple piece of ribbon and a pearl for finishing touches and I’m all done. 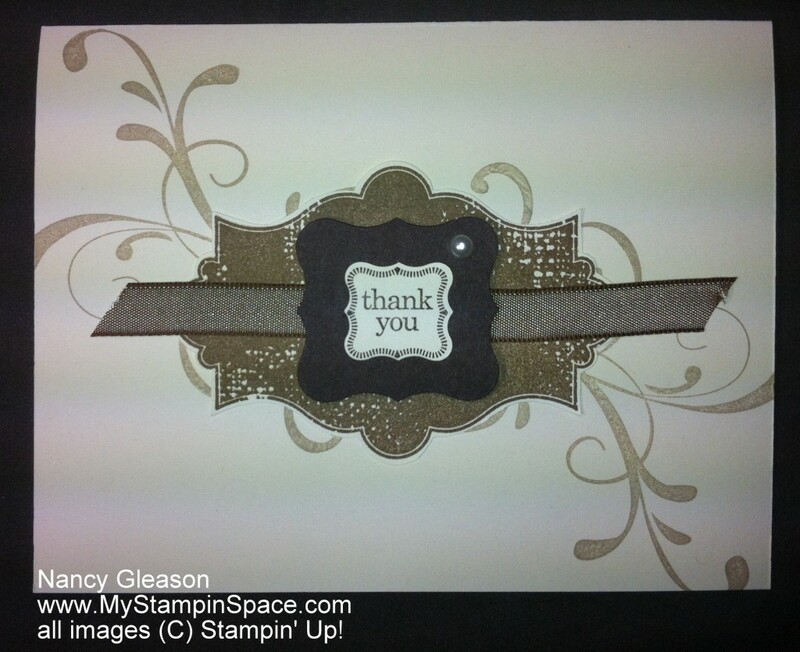 My color combination was a monochromatic look starting with Very Vanilla cardstock, Sahara Sand ink for the background swirl, Soft Suede ink to stamp the worn background image and Early Espresso cardstock and ink for the Thank You sentiment. The items I used are featured below or you can click on the hyperlink above and go straight to my online store and order these products for yourself. So, head on over to my on-line ordering store and pick out your favorite stamp set, and don’t forget to get one, two or even three FREE Sale-A-Bration items. The biggest sale of the year, it runs thru March 22. Want even more? Join Stampin’ Up! during Sale-A-Bration and enjoy all the perks of being part of the Stampin’ Up! family and the wonderful sense of belonging that comes with our Pals Community. 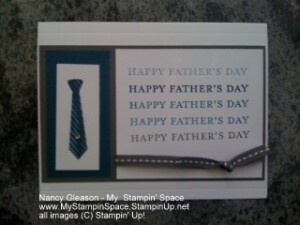 Purchase the Stampin’ Up! Starter Kit for $99 and get $156.50 of your choice of any available Stampin’ Up! products. That’s 25% more Starter Kit products for FREE during Sale-A-Bration. The kit ships FREE for another 10% savings. Learn more! Please leave me a comment and tell me what you stamp set you just had to have, but then didn’t use too much. Then, challenge yourself to dig out that set and make something with it. For a double bonus, send me a pic of what you’ve created and I’ll share it with my readers on my blog! If you like this card, please be nice and share it with your friends or Facebook or repin onto your Pinterest board! and here’s my take on it…. My father-in-law is very ill and currently in the ICU. I thought he needed something to cheer him up, and since my brand new “So Sorry” stamp set was just waiting to be used, it was a match made in heaven! I love the grey herringbone pattern in the Howlstooth & Scaringbone Designer Series Paper # 126906. Nothing halloween-y about this pattern; it’s all masculine. 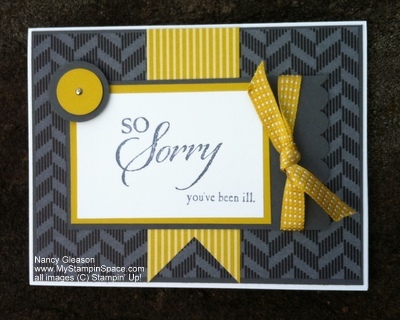 Just perfect for the base for a get-well card for a man. I love the Basic Gray and Summer Starfruit color combination so it’s no surprise that this was the only color combination I even considered. The little piece of ribbon is tied only in a knot, no bow here! The flag in a striped pattern of Summer Starfruit sets off the grey, adding some cheerfulness without being girly. I think the finished product is a winner! Nice and cheery but still masculine. And Dad seemed to cheer up a bit when I gave it to him so, mission accomplished.